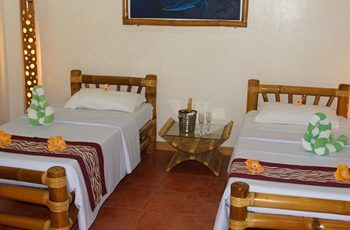 The resort features 2 suite rooms (Stargazer & Birds Nest) and both are located on the 2nd floor above the family rooms. The spacious balconies feature a small bar including a mini-bar refrigerator as well as 2 sunbeds which offer a nice view over the tropical garden towards the pool and sea. 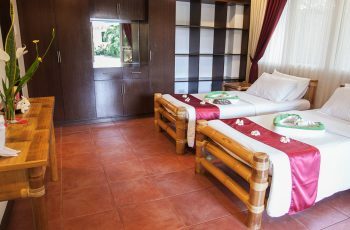 Each Suite has a living room furnished with a beautiful set of one double and two single sofa chairs and a table made of high quality bamboo. A King size bed, a flat screen TV as well as a split air con to cool down the Suite to your preferred temperature will ensure you a good rest during the night. 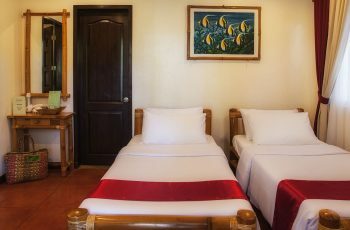 But before you settle in to sleep, you can enjoy the big bathtub with whirlpool or a just a shower in the suites’ comfortable and big bathroom which provides hot water as well as a double sink. Perfect for honeymooners, couples, and single travelers who simply want to pamper themselves. “No reason to leave” Great food, quiet location, relaxing atmosphere. This was a weekend getaway from the hustle of Makati, and it was simply incredible. I booked a suite, which was actually the entire top floor of a townhouse. VERY well appointed for the location, and just a wonderful resort. Manicured lawns, GREAT food, and a little private beach area. It's set up most for those that dive, but it can be enjoyed by anyone. Spend a little extra and get a suite, well worth it! “Pura Vida” means “Pure Life” – And that’s exactly what we want you to feel during your stay with us – ‘la Pura Vida’.